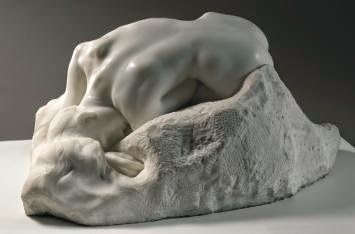 Auguste Rodin (1840-1917) has become so famous that it can be hard to appreciate what a great sculptor he was. 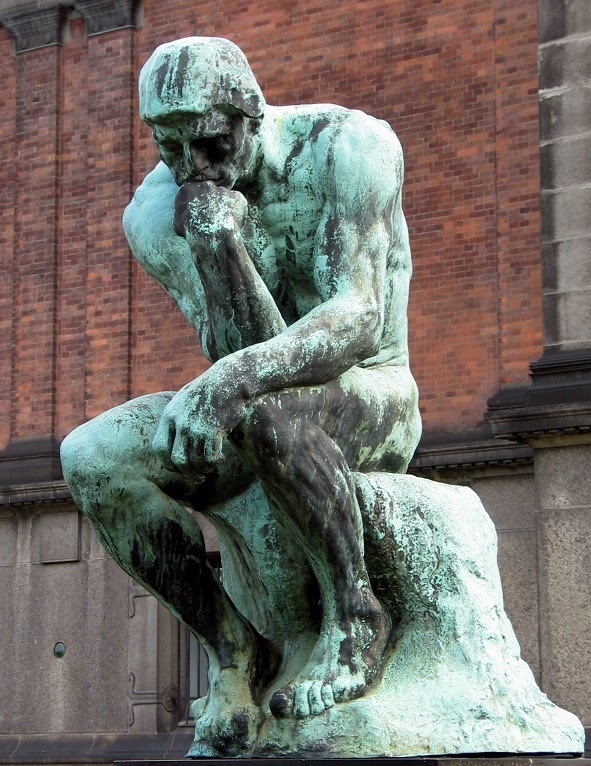 Everyone knows The Thinker -- but, really, before it became an icon it was a terrific piece of work. 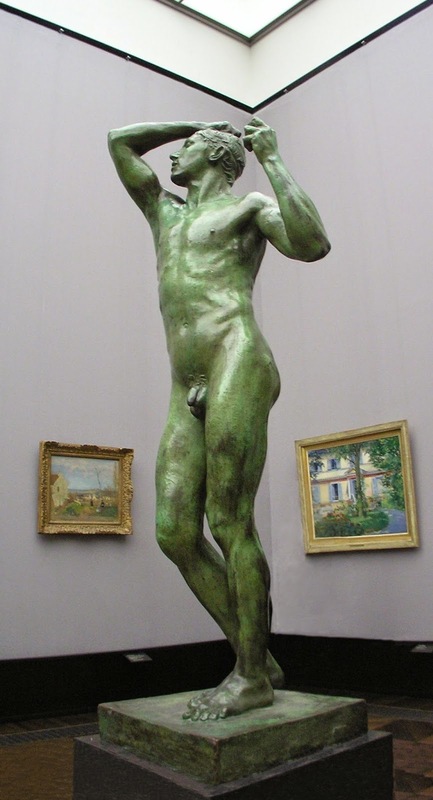 Rodin was no prodigy; his oldest surviving works dates to the mid 1870s, when he was entering middle age. 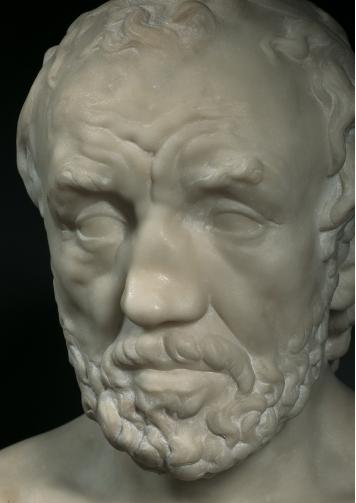 The first full-sized work that he exhibited under his own name was The Bronze Age, 1877. 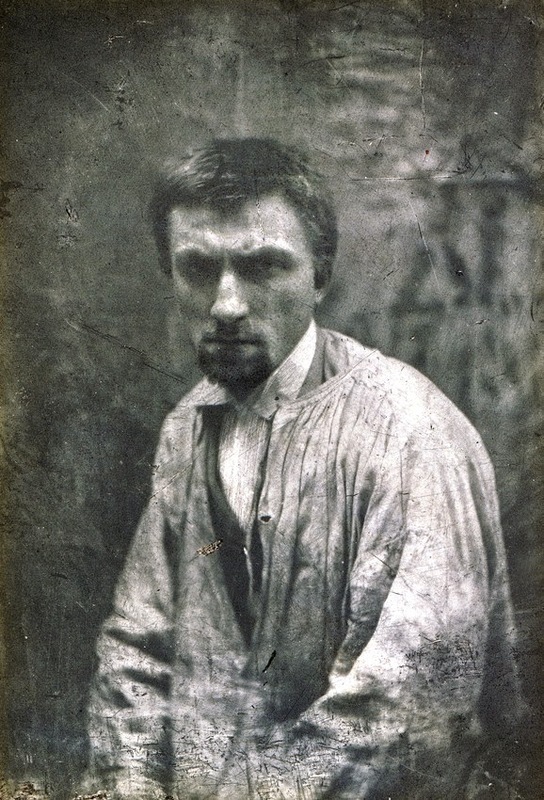 Rodin as a young artist, in 1862. He seems to be glaring, but I think that expression is actually a nearsighted squint. Rodin was obsessed above all with faces and hands -- these were the bearers of meaning for him. He was fascinated by nineteenth-century theories about how climate shaped human life, and he believed that the people of each region shared a common physiognomy. 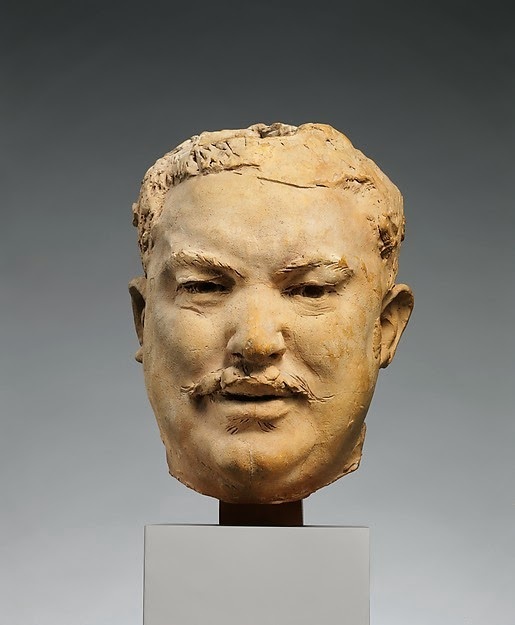 Thus when he was commissioned to create a portrait of Honoré de Balzac, he went to Tours where Balzac grew up and persuaded half a dozen men who looked vaguely like Balzac to sit for portraits. This is one of those preparatory studies, said to be a street car conductor named Estager (1891). 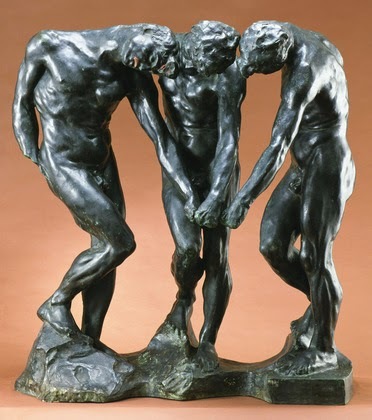 In 1880 Rodin received a commission that in some ways dominated his career. 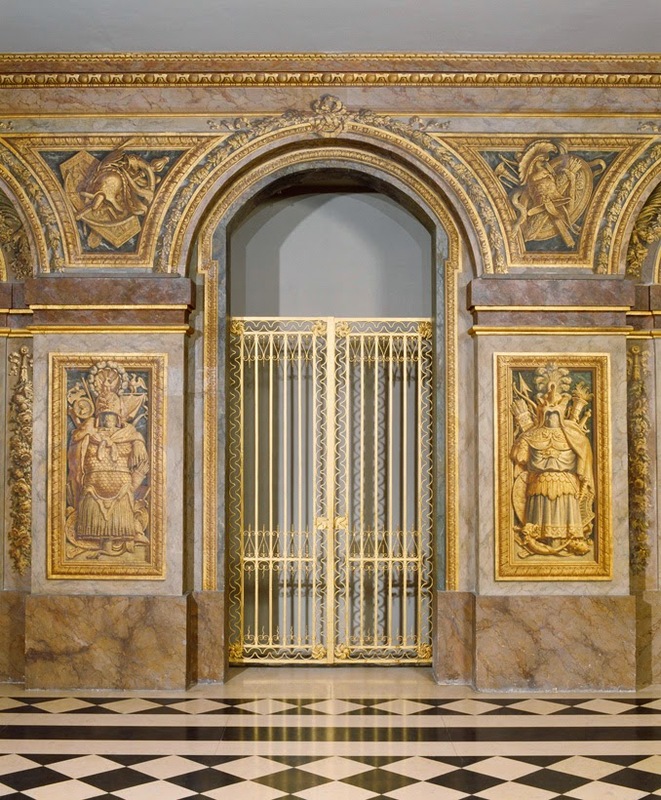 This was for a doorway to a new museum in Paris. 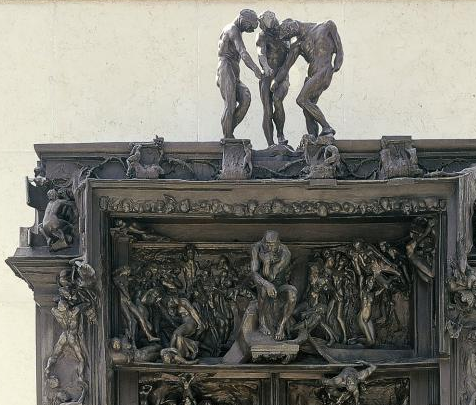 Rodin decided to base his doorway on Dante's Inferno, and the resulting creation is known as the Gateway to Hell. 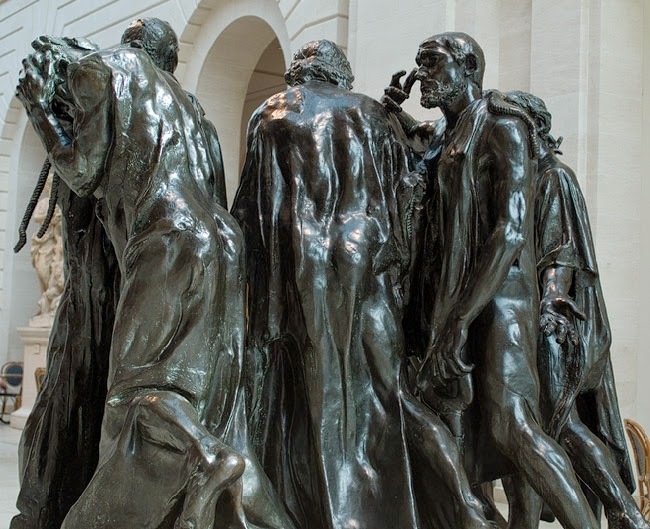 However, Rodin never finished his masterpiece; it was never cast in its entirely until after his death. Instead he spent 37 years tinkering with various designs and sculpting various elements of the composition. 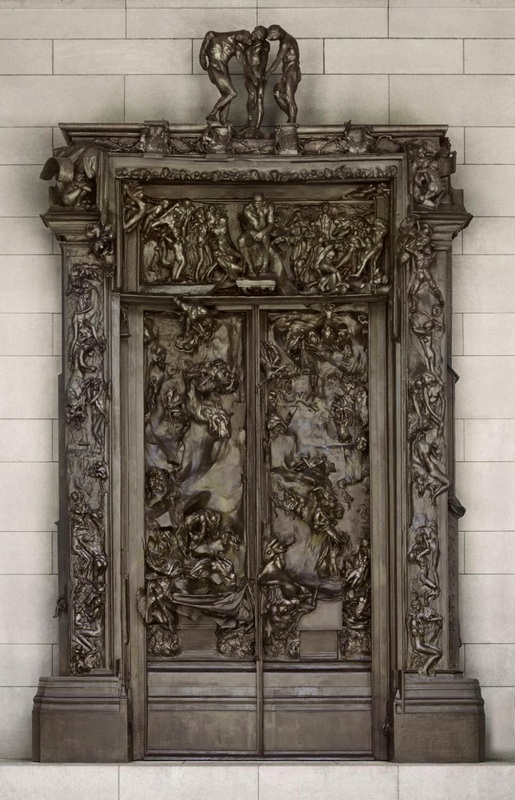 Several of Rodin's most famous works were originally conceived for these doors. 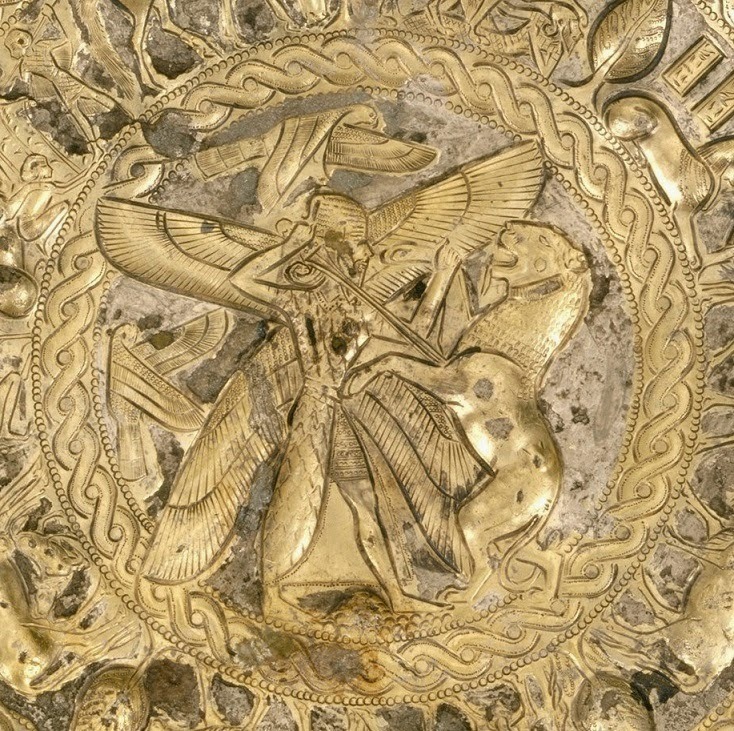 The Thinker sits in the center; around him are Eve, The Kiss, I am Beautiful, and others; at the top are the Three Shades. 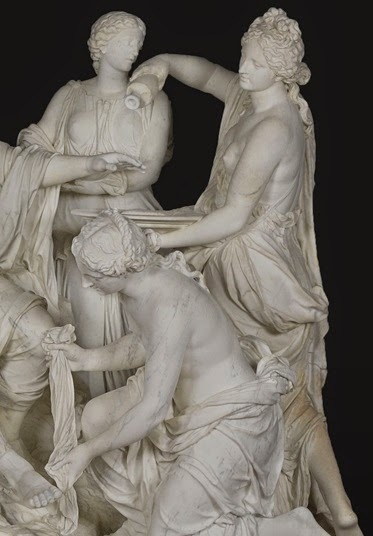 The Kiss in marble, 1882. 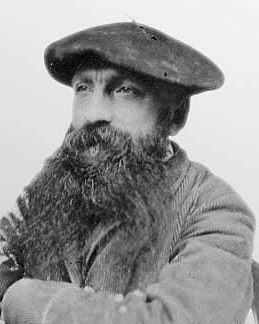 Rodin at the height of his career. 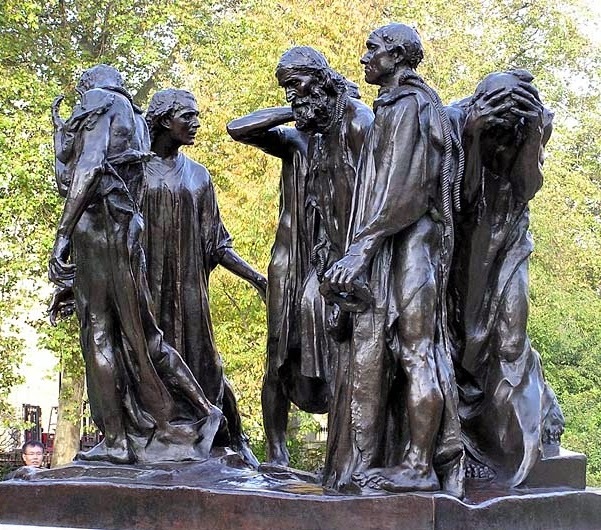 Another of Rodin's hugely famous works is The Burghers of Calais (1889). This was commissioned to promote French patriotism in the aftermath of the disastrous Franco-Prussian War. 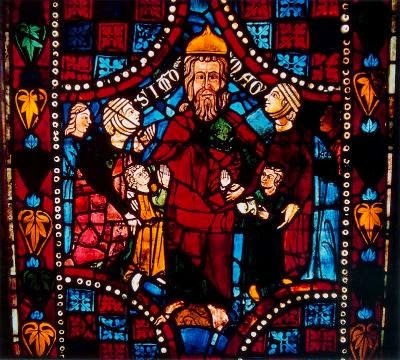 It depicts the six leading men of Calais who volunteered to serve as hostages to Edward III of England when he threatened to destroy the city in 1346. 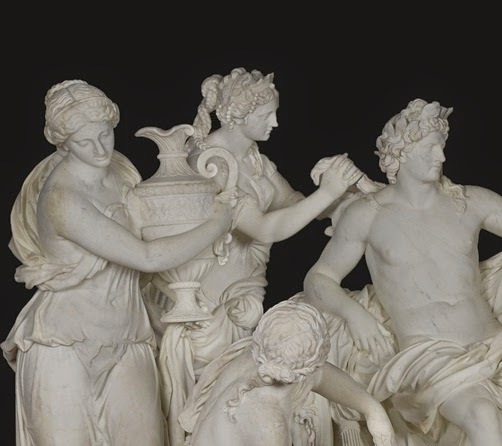 The commission called for a heroic monument focusing on Eustace de Saint-Pierre, their leader, but Rodin made it clear he had no interest in such a treatment. Instead he rendered all six men as equally important, all individuals reacting in different ways to the crisis. 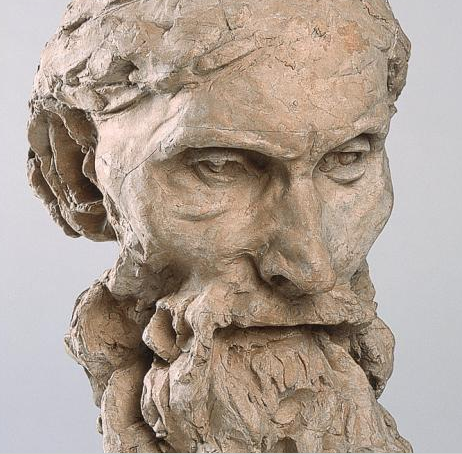 Rodin's preliminary models divided the commissioners, but eventually they decided to proceed with Rodin's design, and the result was an immediate success. Millions of people have felt ever since that these dignified old men have a heroism beyond that of any conqueror on horseback. gave rise to several studies and variants : “In the room he used as a studio, ten or so clay heads of Clemenceau, cut off at the neck, stood on turntables and consoles. It was incredible… Rodin sculpted as an engraver produces aquatints, in states. 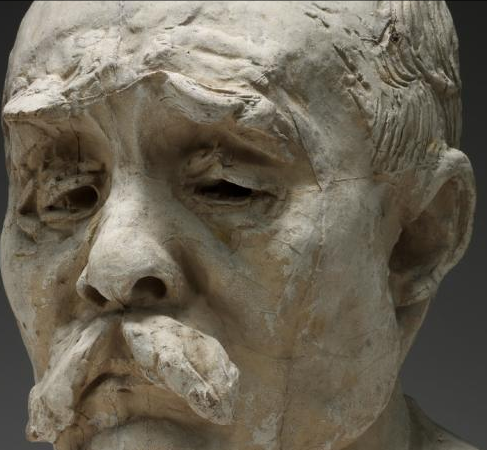 In order not to ‘tire’ his clay with numerous amendments, he had several casts made, experimented on these successive copies and thus reworked them ten or even twelve times…” Clemenceau did not like his bust. He said that Rodin had made him look like a soldier of Napoleon’s old guard and refused to let him show it at the Salon of 1914. American photographer who got her MFA in 1981. I just got her wonderful book Beijing out of the library, so all these are photographs are of China. But there are photographs of many parts of the world on her web site. Sadly most of her photographs are in this wide format which is impossible to display on Blogger, so you'll have to click to see them correctly. Love these lotus pictures, part of a whole series. With the allies, with their ground troops, and if we do our job right and the Iraqis fight, then over time our role can slow down and taper off. And their role, reasserts itself. But all that depends, Steve. And nobody’s clearer than I am about this. That the Iraqis have to be willing to fight. And they have to be willing to fight in a nonsectarian way. Shiite, Sunni and Kurd alongside each other against this cancer in their midst. To which I say, well, ok, but what if none of that happens? Do we walk away, or keep escalating our own involvement? I hope the former but fear the latter. 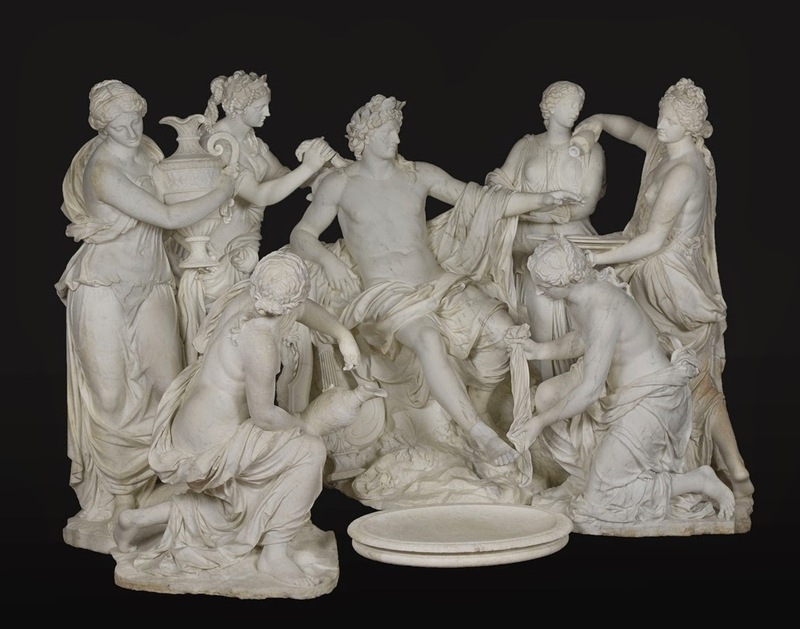 Apollo Served by the Nymphs, carved by François Girardon and Thomas Regnaudin between 1666 and 1674, usually at Versailles but now part of a travelling exhibit. 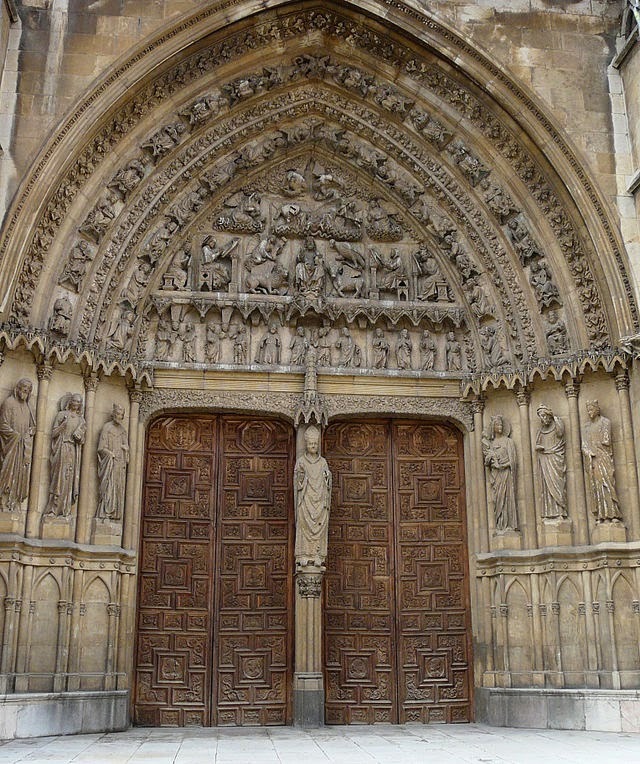 Gate of the Salle de Hoquetons. The Hoquetons were the palace guards. 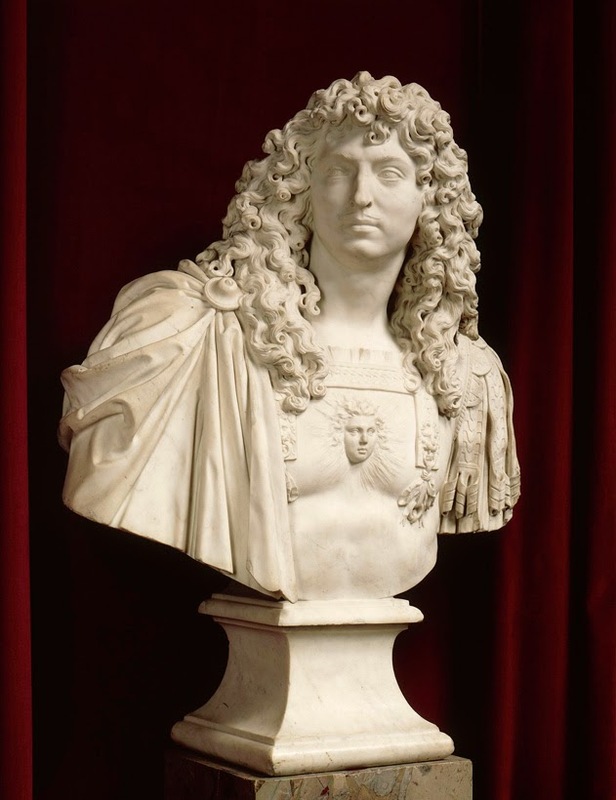 Bust of Louis XIV carved by Jean Varin beginning in 1665. Fireworks staged in August, 1674 to celebrate one of France's victories, and also the completion of the Grand Canal and surrounding gardens. 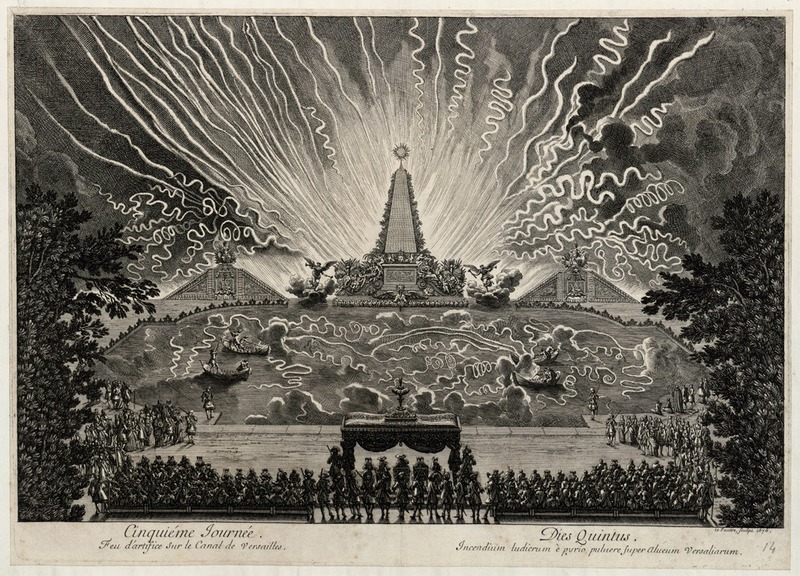 Engraving by Jean Le Pautre. I have spent much of my spare time over the past month slogging through William Vollmann's 750-page epic, which won the National Book Award in 2005. I had several reasons for persevering with Europe Central. Vollmann is regarded in some circles as one of our most important thinkers, or at least the most intellectually interesting novelist of our times. He is an outsider intellectual, not part of academia or any other identifiable cultural elite. 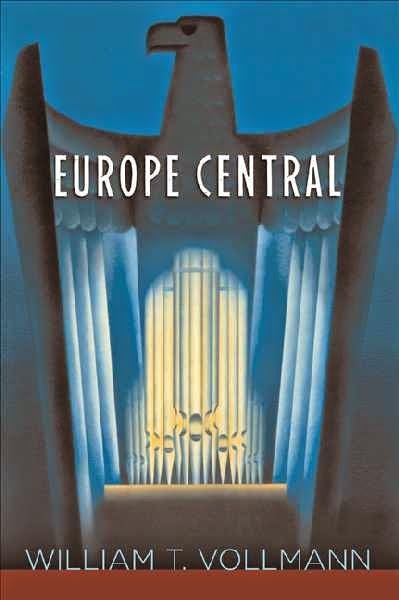 Since I also sometimes consider myself an outsider intellectual, I wanted to give his work a try, and various critics have proclaimed Europe Central his most accessible and possibly best book. Plus, it is interesting, in parts very much so. So I kept at it until I finally stumbled to the end. Europe Central is a historical novel about the region between Dresden and Moscow over the period from 1920 to 1970, focusing mainly on World War II. It is divided into sections that have no direct connection to each other. Each section follows one character or small group of characters, all of them historical people, for a period that varies from a few months to many years. The characters include German artist and antiwar activist Käthe Kollwitz; Field Marshal Friedrich Paulus, the German commander at Stalingrad; SS officer Kurt Gerstein, who tried to document the atrocities of the Holocaust so that its organizers could eventually be prosecuted; Soviet general Andrey Vlasov, who ended up trying to lead an army of anti-Stalinists fighting on the Nazi side; Russian film director Roman Karmen; East German prosecutor and judge Hilde Benjamin; and especially composer Dmitri Shostakovich, the only character who comes back for repeated chapters. The Shostakovich chapters were actually my least favorite, and I kept groaning whenever he appeared again, but as I will explain I think they are crucial to understanding what Vollmann was about. Vollmann's research is prodigious, and sometimes he chooses scenes or events that brilliantly illuminate the times. But I have to say that his writing often irritated me. His attempts to vary the storytelling voice result in prose that is shrill, disjointed, and more distracting than anything else. At several points I found myself thinking, this is interesting but only because of the history, and I would have liked it a lot better if Vollmann had just written a straight historical narrative. Europe Central contains a variety of surreal departures from history that are mostly unsuccessful, although I rather enjoyed the chapter in which a German soldier at Kursk finds himself re-enacting the Niebelungenlied in the company of Wotan, battling Soviet soldiers who keep rising back up as zombies. In this Europe Central reminded me of Thomas Pynchon's Gravity's Rainbow, which is also full of fascinating history but written in such an irritating way that I never finished it. What Vollmann captures in Europe Central is the need to make choices. Often all the choices are bad -- after all, the characters are trapped between Hitler and Stalin -- but that is no excuse not to choose. Vollmann's main interest has always been the marginal and downtrodden, rather than the movers and shakers of the world. The characters of Europe Central are mainly people caught up in events over which they have no control, events so terrible that they could do hardly anything to mitigate them even if they tried. Yet they still face choices. Vollmann has said that there are two heroes in the book, Shostakovich and Kurt Gerstein, both of whom (says Vollmann) fought against the atrocities of their age as best they could. This is interesting because both men camouflaged their resistance under facades of obedience, and in fact both were attacked as willing servants of tyranny. Gerstein was actually indicted for genocide and killed himself in prison. Shostakovich had strange career under Stalin, interrogated several times by the NKVD, forced to engage in "self criticism" over some of his works that were deemed anti-Soviet, but then awarded the Stalin Prize for his Leningrad Symphony. In Vollmann's telling he gives just enough obedience to the party to stay alive, while secretly writing music that serves to catalog its crimes. Mainly Shostakovich tries not to think about politics at all, preferring to anguish over his love affairs, which is the most tiresome thing about Europe Central. Vollmann's Shostakovich is one of those men who has many lovers but imagines each relationship as a great and perfect love and is devastated when one of his lovers rejects him. He becomes obsessed with the one woman who refused him and thinks of her more often than anyone else. She seems to represent everything else that slipped away: innocence, youth, artistic integrity, all the friends who disappeared into the Gulag or were killed in he war. At times Vollmann seems to present passionate love as the one of the two possible antidotes to totalitarianism; Shostakovich remains in some sense pure through the war and the purges because his desire is so great, his feelings for women so strong. The other force that opposes totalitarianism is art. Vollmann makes repeated references to one of Shostakovich's compositions, Opus 110, the Eighth String Quartet. There will be a horrible sound, say the scream of a wounded person or the clanging of a prison door, and Vollman's Shostakovich stores it away to include in his Opus 110. 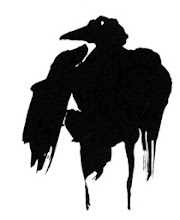 Best listened to in a windowless room, better than best an airless room -- correctly speaking, a bunker sealed forever and enwrapped in tree-roots--the Eighth String Quartet of Shotakovich (Opus 110) is the living corpse of music, perfect in its horror. Call it the simultaneous asphyxiation and bleeding of melody. There is a lot of folklore surrounding this piece, including a report from a family friend that Shostakovich intended it as his suicide note but then couldn't pull the trigger. Volllmann makes it Shostakovich's supreme act of resistance to Stalinism, his way of bearing witness to terrible crimes. I've listened to it twice while writing this, and I have to say that while it is grim, it does not strike me as more grim than a lot of other twentieth-century music. It is also much disputed among musicologists whether Shostakovich actually composed in the way Vollmann attributes to him, using sounds or themes to reference particular events or ideas. Much of what he wrote about music advocated strict formalism, that is, music that references only itself, or other music. But anyway this is what Vollmann gives us. Vollmann's world is full of horrors. He wastes little time condemning the authors of the particular atrocities he documents; from a moral perspective war and genocide come across as much like earthquakes or plagues. What matters is how we respond to them. I found it interesting that instead of people who stood up boldly against Hitler or Stalin and got shot for it, Vollmann focuses on Shostakovich the great survivor. We are not called on, he suggests, to sacrifice our lives in futile gestures. We are called on to muddle through as best we can, avoiding if possible personal crimes, but saving our outrage for expression in some secret or semi-secret way. Meanwhile we should get on with our lives, loving and working and getting by. We may be crushed by history like soldiers crushed by tanks, but at least we will not ourselves have been the instigators of evil. With any luck we will live on into better days, when our documentation of the horrors we witnessed can be made public, and we can shout out the outrage we had to hide. Which is interesting, but probably not worth 750 pages of Vollmann's prose. 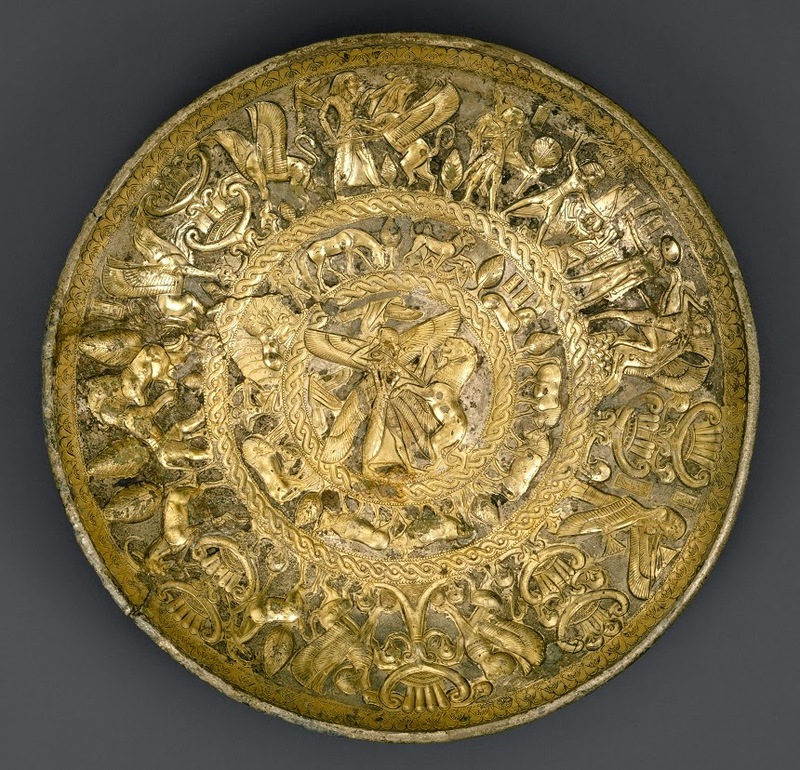 This silver-gilt bowl was made in Cyprus around 700 BCE. 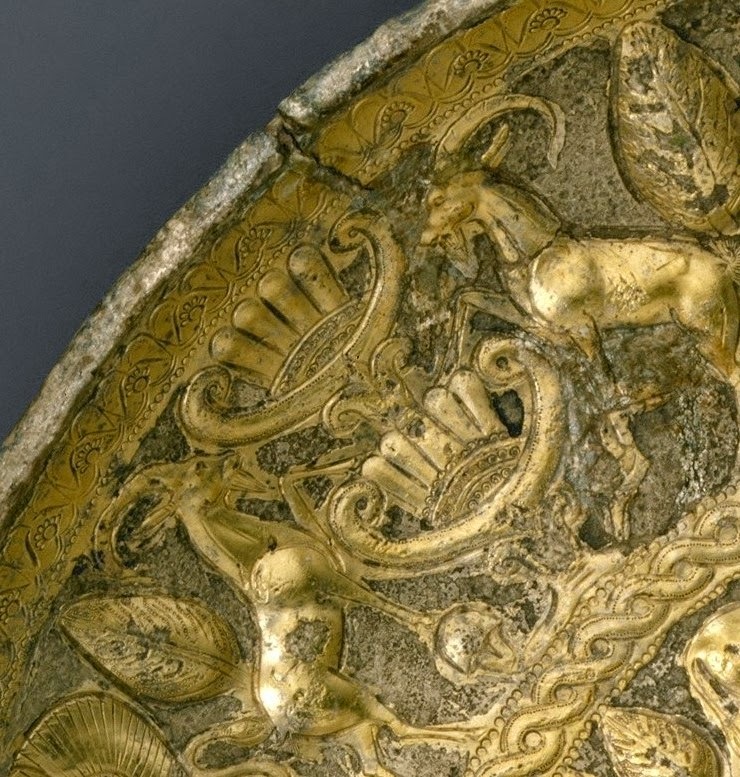 It fascinates me because it combines elements from two very different artistic traditions, the Assyrian and the Egyptian. 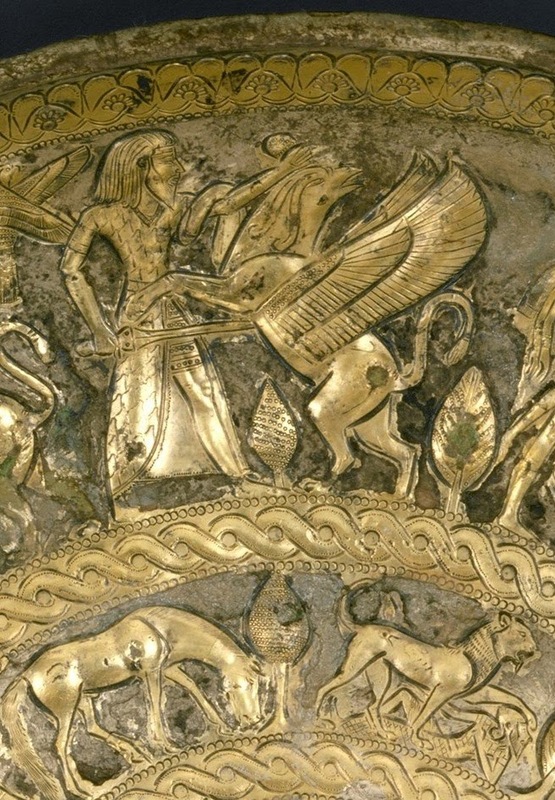 The central figure could have stepped off one of the walls of Nineveh. But this image wandered in from tomb painting in the Valley of the Kings. 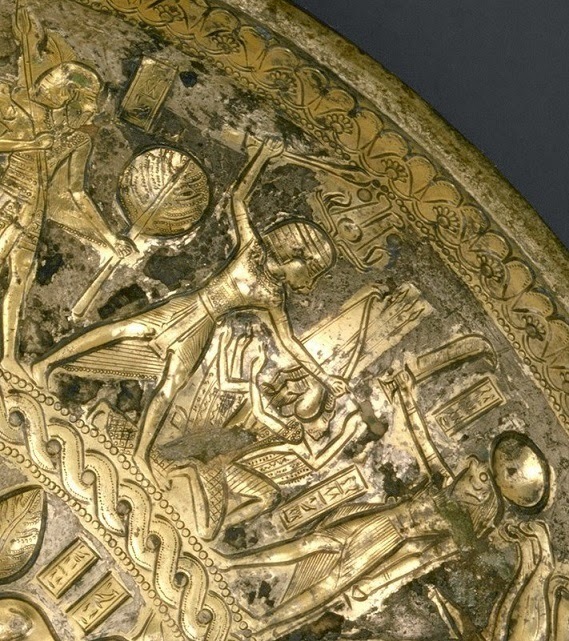 And this also looks very Egyptian to me. 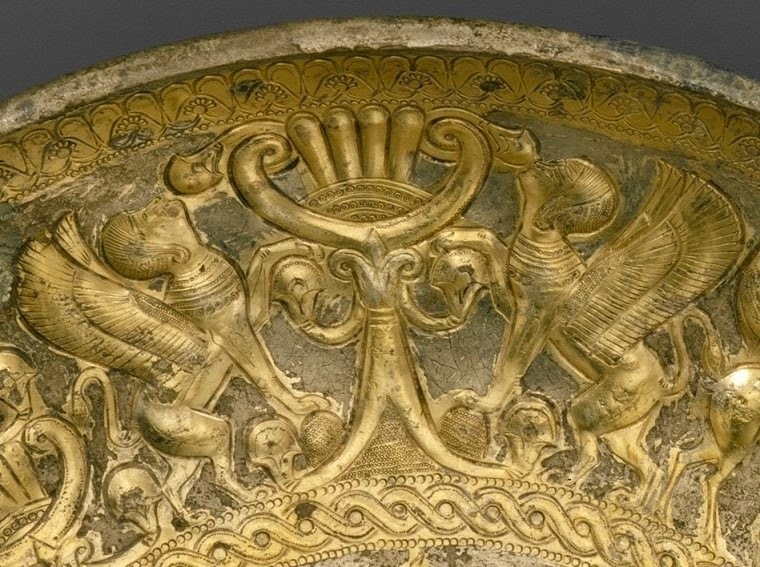 Did some Cypriot prince want vessels he could use to serve either Egyptian or Assyria ambassadors? Or did he just like both styles? In the Met. Throughout American history, a recurrent narrative has warned of the danger of small, tight-knit groups, following a charismatic leader, and allegedly prone to sexual abuse and misconduct, the maltreatment and exploitation of members, violence and financial fraud, brainwashing and mind control. Although the word “cult” has no strict social scientific definition, a useful checklist for such groups would include such categories as authoritarian, puritanical, totalistic, charismatically led, and intolerant. Wherever we look in US history, we find public fears about such groups, whether we are considering the 1820s or 1880s, the 1920s or (especially) the 1970s – the years of massive reaction against unpopular or stigmatized groups like the “Moonies” (Unification Church) and Scientologists, Hare Krishnas and Children of God, The Way International and Synanon. Cults continued to be national news between 1984 and 1994, with the absurd Satanic Panic, and were in the news with the Waco Siege of 1993, and the mass suicides of the Heaven’s Gate and Solar Temple movements. . . . compared to the 1970s, the cult issue has vanished almost entirely. When did you last see the once-familiar media story about Group X with exposés of its sinister guru, with tragic images of weeping parents wondering how their child could have become associated with this dreadful organization? Why would they renounce their worldly hopes to devote their lives to this evil sect? It is striking that we don't seem to be hearing much about such groups these days. But does it mean anything? Philip Jenkins thinks it is a sign of the increasing secularization of our society; a decline in confused young people joining cults is in his mind a sort of canary in the coalmine for a broader decline in religious enthusiasm. Ross Douthat has a column today that connects this religious trend to bigger issues, through the writings of libertarian billionaire Peter Thiel. I have to say that this leaves me scratching my head. It seems to me that our society is still full of enthusiasts who take unorthodox ideas seriously, from off-the-grid organic farmers to right-wing militias. Thiel grew up with the internet cultists of the 90s, so I suspect what he really misses is the belief among techno-anarchists that the net would lead to a fundamental restructuring of civilization. Maybe that belief did inspire some of them to great feats of programming, but it was always stupid and it has now been refuted by events. Thiel's screed strikes me as just another version of the fear that industrialization and mass culture are stamping out individuality, a fear that has been with us for as long as industrialization and mass culture. And perhaps our society is less creative, person for person, than certain past societies like classical Athens or Renaissance Florence. So? It is the modern era that has wrought the greatest changes on earth, and on human society, for both good and ill. Maybe this is a boring decade in North America, but zoom out a little and you still see that coping with the effects of change is a much bigger challenge for us than stasis. The crazies are still with us, in many forms. So I suspect cults are declining because of some combination of secularization and Prozac, and that Thiel's worries make no more sense than I would expect from a prominent libertarian. 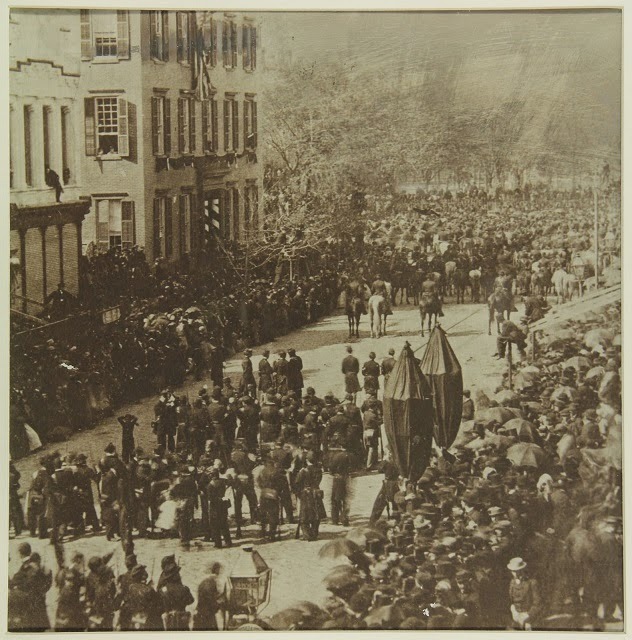 This photograph shows Abraham Lincoln's funeral procession passing through Manhattan on April 25, 1865. 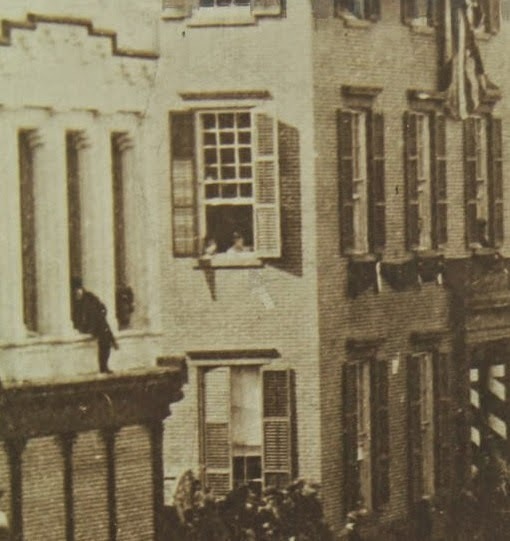 The house on the left is the home of Cornelius Van Schaack Roosevelt at the corner of Broadway and Union Square. Zoom in on the window and you can see two figures watching the procession. They are future president Teddy Roosevelt, six years old, and his brother Elliott, four. Of all the things to survive. 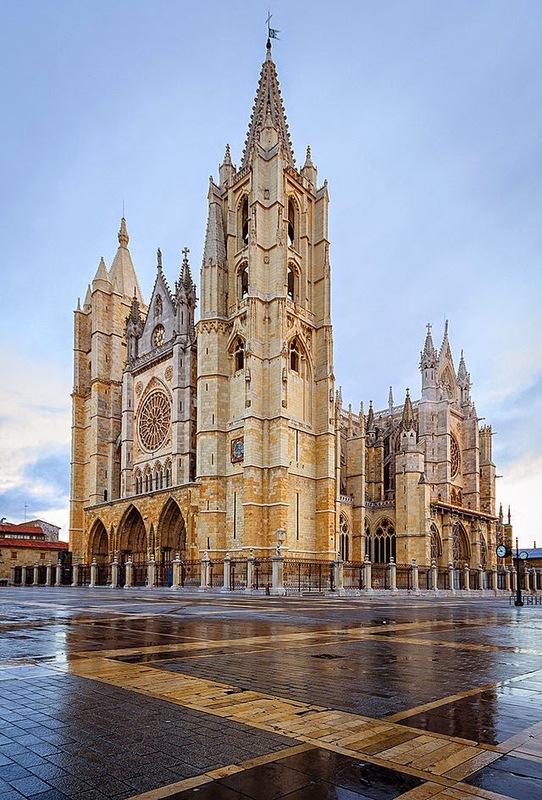 The Cathedral in León is one of the most famous and beautiful in Spain, even though much of what you see today was rebuilt in the nineteenth century. The Cathedral was built over Roman ruins, some of which you can now see in the crypt; this is the baths built by Legio VII Gemina in the second century CE. Building the huge cathedral across the Roman rubble turned out to be a big mistake, which we'll get too later. 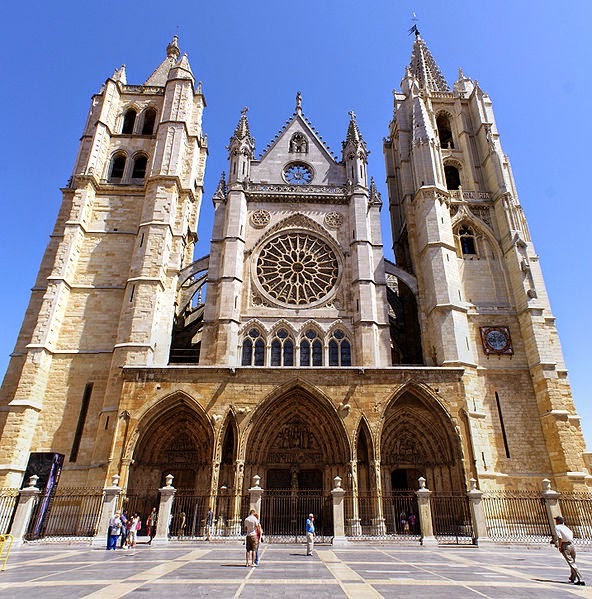 The first Cathedral was built in the tenth century, supposedly by King Odrono II of León after he defeated the Arabs at the Battle of San Esteban de Gormaz in 916. That cathedral was, so the chronicles say, burned by the Muslim conqueror Almanzor (al-Mansur bi-llah, the Victorious by God) in 988 and had to be replaced in the eleventh century. 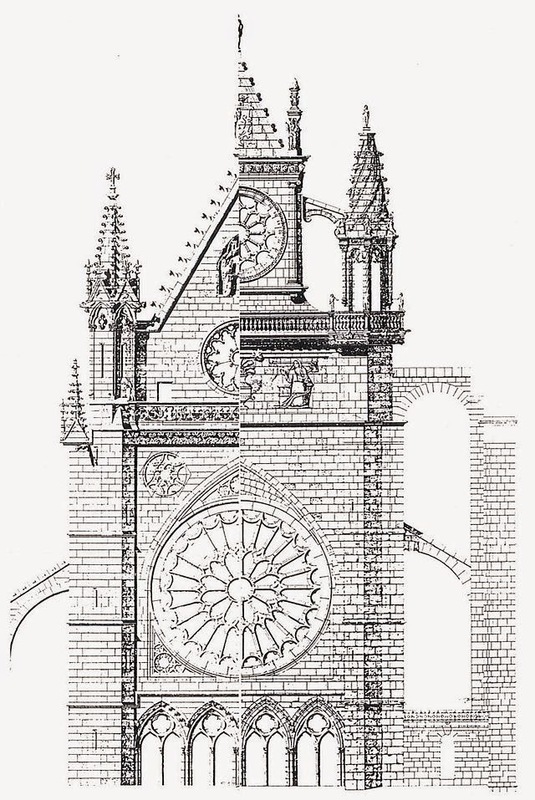 For obscure reasons the eleventh-century cathedral also fell into disrepair, so in 1205 King Alfonso IX began building a new one in the Gothic style. However, the foundations started to crumble as soon as they were built, presumably because they were built on that unstable Roman rubble, and very little happened until 1255. 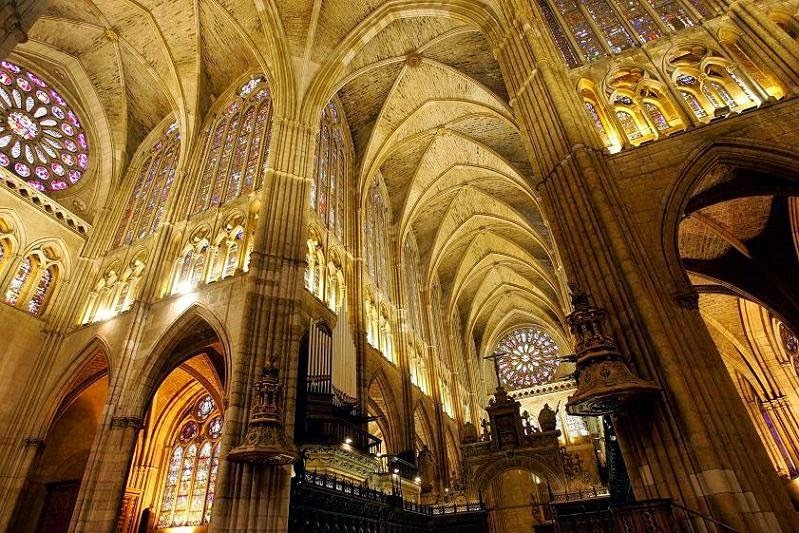 Around that time King Alfonso X brought in a new architect, termed in our records Master Enrique, and he was able to solve the foundation problem well enough to get the works under way. 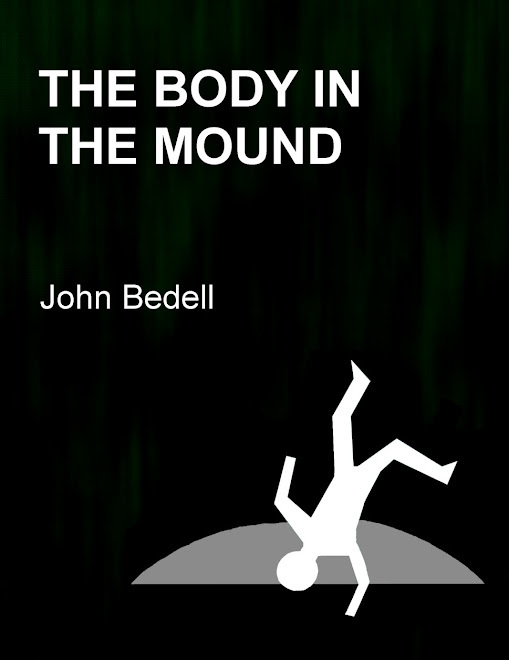 Nailed up inside the Door of Saint John was for many decades a sad old skin identified by Leonese as "the evil mole." 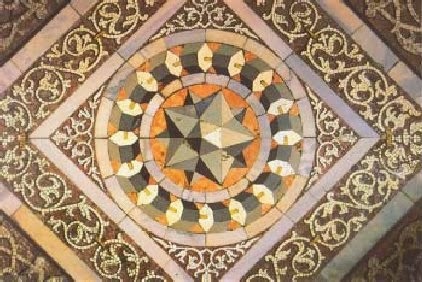 According to legend, it was this mole that kept coming out every night and undermining the foundation work that the masons did during the day. This went on until the Leonese waited up one night with clubs, ambushed the evil mole when he emerged, killed him and mounted his skin on a pole beside the works. Sadly Google cannot find an image of the evil mole. 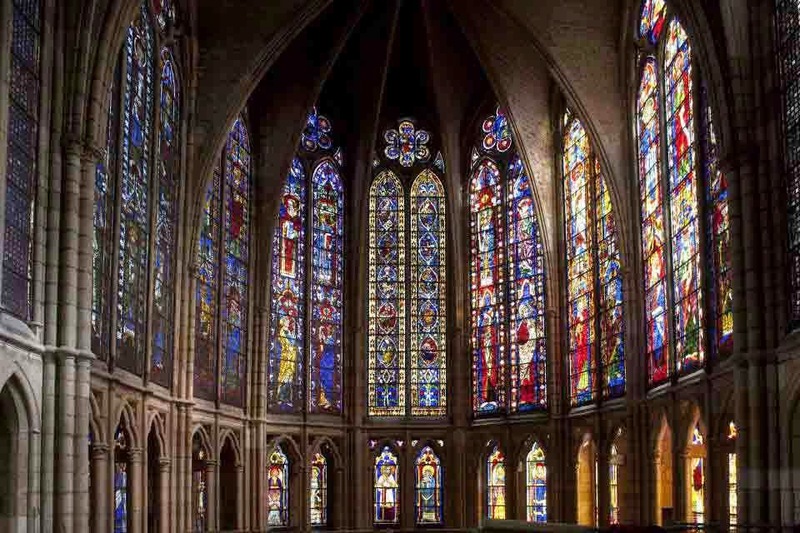 The style of the new cathedral was obviously influenced by the French Gothic, especially Reims and Notre Dame de Paris, so Master Enrique must have at least traveled in France and probably worked there. 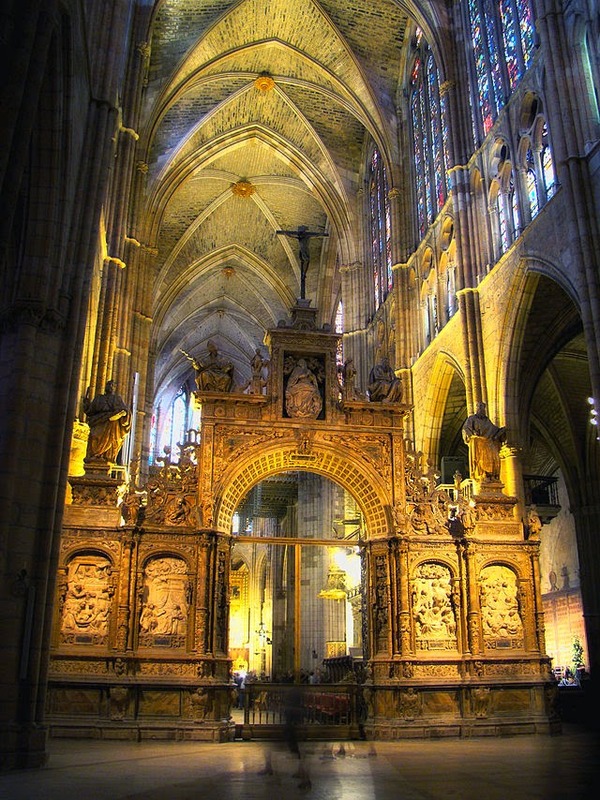 Master Enrique died in 1277, but work on the cathedral continued, and it was consecrated in 1302. 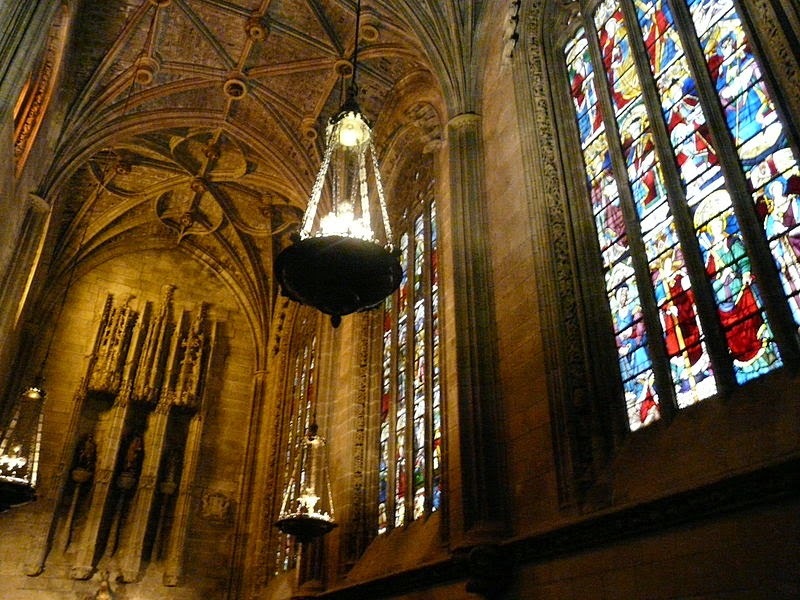 Work continued through the fourteenth century, and much of the stained glass dates to that time. So does the southern tower. In the fifteenth century, alas, the thing began to fall apart. Partly because of the unstable foundations, and partly because much of the stone was a rather soft, crumbly sandstone, the walls settled unevenly, putting unsupportable strain on the upper works. Extra buttresses were added, and they held things together for a while, In 1631 the crossing collapsed, bringing down much of the roof. The Gothic tower was replaced with a Baroque dome. By 1844 the whole structure was in danger of collapsing. The crown of Spain designated it he nation's first historic monument, to assist in raising funds for restoration. 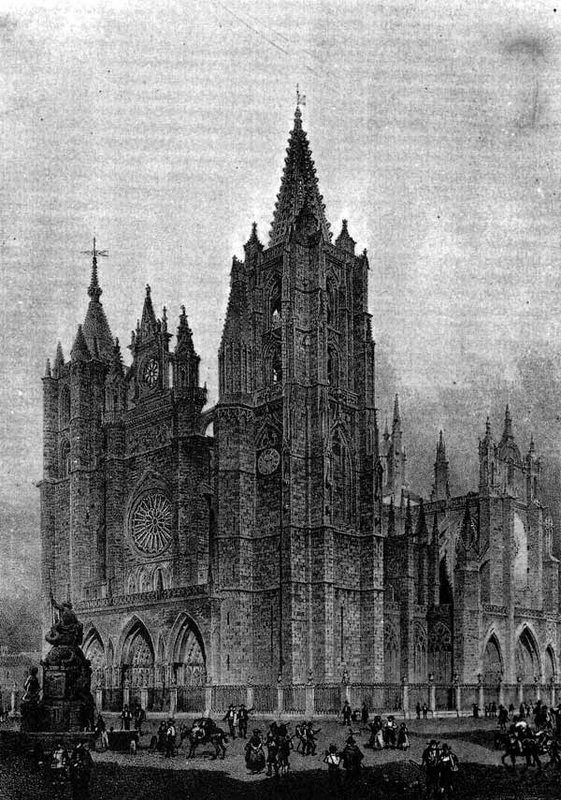 (Above, the Cathedral in 1850). Among other things, the facade was completely rebuilt. This drawing shows how the facade was changed; old on the right, new on the left. So, anyway, much of the modern fabric is not original. 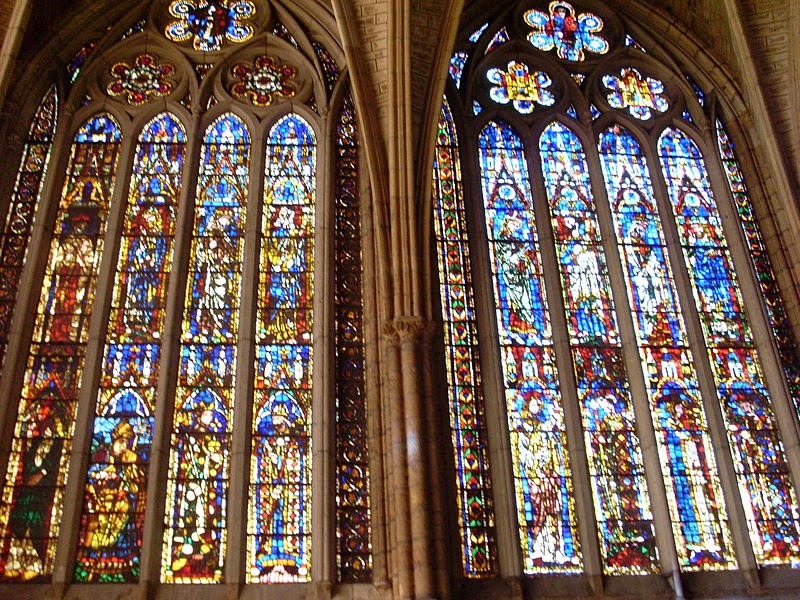 But much of it is, including the wonderful windows. 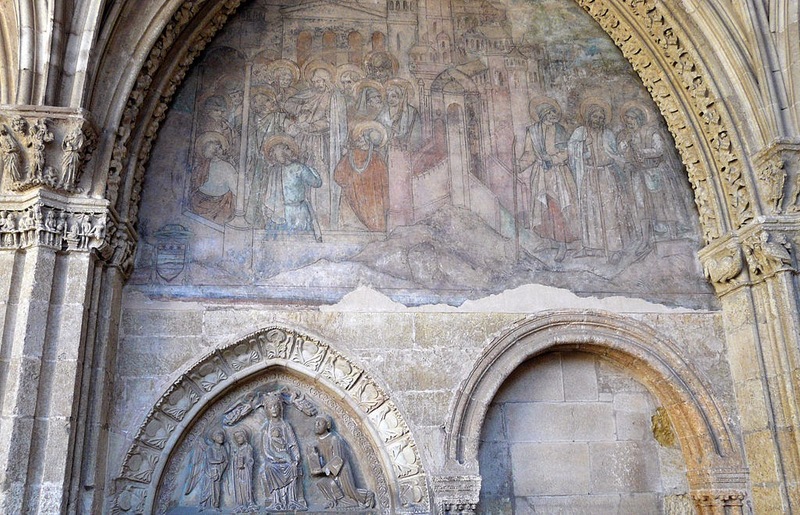 Fifteenth-century paintings by Nicholas French. 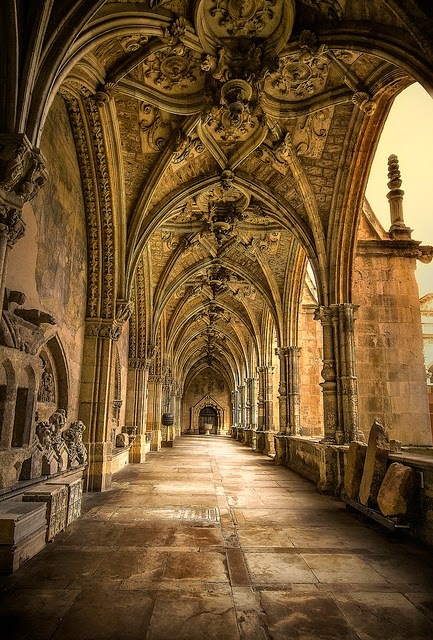 The cloister, redecorated in the early sixteenth century by Juan de Badajoz el Mozo. So a wonderful building, maintained through the centuries despite the curse of the evil mole and all the other problems that have bedeviled it.